This Tuesday CKUT is teaming up with the St-Ambroise Montreal FRINGE Festival and Headless Goat Productions to present Old Time Radio Theatre. Tune in to CKUT 90.3 FM on Tuesday June 5th at 8:30 PM to hear a classic episode of «Suspense» performed live on the air by a cast of talented actors replete with live sound effects. The FRINGE Fest has been celebrating creativity in the fields of music, comedy, dance and theatre for 22 years. FRINGE Fest 2012 is taking place from May 30th to June 19th, with over 500 performancers hailing from Montreal to Greece to Japan! Visit the FRINGE Festival website to learn more about the hundreds of performances they’ve got planned for the city of Montreal. 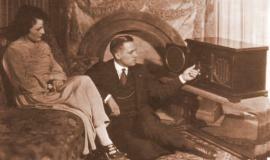 See the Old Time Radio Theatre facebook event for detailed cast, director and producer information.